The Secret Cause of Procrastination – Love. Life. Practice. One of the bloggers that I faithfully read is Mark Manson. While he might use a little too much profanity for some tastes, I really enjoy (and, let’s be honest, emulate) his style of writing and I almost always take away something useful (or at least insightful) from his posts. When his newsletter announced that his new blog was about procrastination, my Personal Development Senses tingled: that is a subject I can talk about forever. In fact, a great deal of my posting about “practice” has to do with the idea of how to get past putting things off and into getting things done – whups, I mean “getting things accomplished” since I don’t want to infringe on any GTD copyrights. Wait, GTA is already taken as well…I’ll have to figure out a better acronym for productivity. Someday. First I have to finish this post, right? And right there is my own tragic flaw: I have so many ideas that they are like squirrels running around the tree of my brain, and every one of them could be the one! so I have to keep chasing them. As a result, my back burners have back burners and my “someday” file is stuffed to overflowing. Or it will be, whenever I get around to creating it. What were we talking about? Oh, yes! 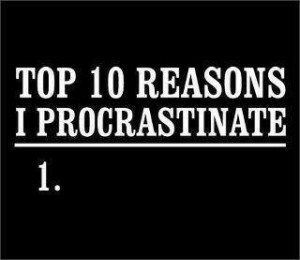 Procrastination! As I was saying before the squirrels invaded, most of my writings about overcoming procrastination are rooted in tactics – as Mark Manson called them, band-aids – that treated the symptom well enough, but not the root cause. the more you will avoid doing it. Simple as that. It’s all about how the story you can write for yourself can threaten the story you have written for yourself. Maybe “fear of jumping the shark” would be an appropriate way to do it. The sneaky thing about the human psyche is that it likes the status quo, right up until the point where it doesn’t. So whether things are good or bad, if they’re relatively comfortable, your subconscious will invent reasons not to change. Hence, procrastination. It’s not about laziness, it’s not lack of ambition – it’s fear. Mark talks about a lot more in the post – I’m deliberately keeping this one short so that you will be motivated to go off and read it for yourself. There’s even some great stuff in there that corroborates my own dislike of affirmations. You should make some time to read it. And hey, let him know Gray sent you (not that he knows me from Adam, but I enjoy sowing confusion where I can). Don’t put it off, ok?